For years, McElroy Metal has been a leading provider of products and services when it comes to metal roofing in Bossier City. 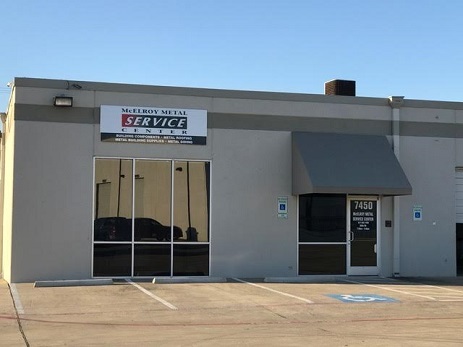 Richland Hills, Texas, residents can now enjoy the same quality and high level of service that Louisiana residents have been enjoying all this time, thanks to our new metal roofing service center. The metal roofing professionals at McElroy Metal have been manufacturing siding, substructural components and other metal roofing products for more than five decades. We’ve been able to expand all over the country due to our hard-earned reputation for providing superior metal roofing products when it comes to both residential and commercial structures. This state-of-the-art service center means Richland Hills residents and Texans in the surrounding area no longer have to search far and wide for the right materials for their metal roofing jobs. We can take care of all your needs right here in Richland Hills, and we deliver products fast and on time, so your roofing job can proceed on schedule. Remember that at McElroy Metal, we’re not just a provider of great metal roofing products. We’re also a full-service metal roofing center in Richland Hills, Texas, so whatever your metal roofing service needs are, give us a call and we’re sure we can accommodate you. We’re proud of our Louisiana roots. Thomas E. McElroy Sr. started our metal roofing operation in Bossier City, Louisiana, in 1963, and his passion and dedication to the business have only grown. Now we can offer service and metal roofing products at more than 30 manufacturing or service centers around the country, including our metal roofing service center in Richland Hills, Texas. As proud as we are of those roots, we are equally proud of the service we provide at our Richland Hills, Texas, metal roofing service center and at every manufacturing and service center we own. We’re determined that every customer at every one of our locations experiences the same great service and enjoys the same high-quality products as those that made our business so successful in Bossier City. Richland Hills residents are quickly learning why McElroy Metal is the place to go for all your metal roofing needs. If you have metal roofing product or service needs anywhere in the Richland Hills, Texas, area, give McElroy Metal a call or stop by. You’ll find everything from exposed fastener panels to standing seam systems, retrofit systems, concealed fastener wall panels, soffit panels and more. We invite you to look around our website and check out our product line. If you don’t see what you need, come see us or give us a call anyway. If it involves metal roofing, we bet we can help. We can’t wait to make you another lifelong customer.